After an incident where Officer Witten’s (Lauren Patten) backup physically could not keep up with a chase, Frank must decide whether to implement a more rigorous fitness test for the NYPD. Also, Danny is hesitant to pursue a cold case after learning who the original detective was; Anthony begs Erin to stall a murder trial so he can gather more evidence; and Eddie is vexed by Jamie’s disapproval of her joining a fraternal organization, on BLUE BLOODS, Friday, April 5 (10:00-11:00 PM, ET/PT) on the CBS Television Network. "Rectify" -- After an incident where Officer Witten's (Lauren Patten) backup physically could not keep up with a chase, Frank must decide whether to implement a more rigorous fitness test for the NYPD. 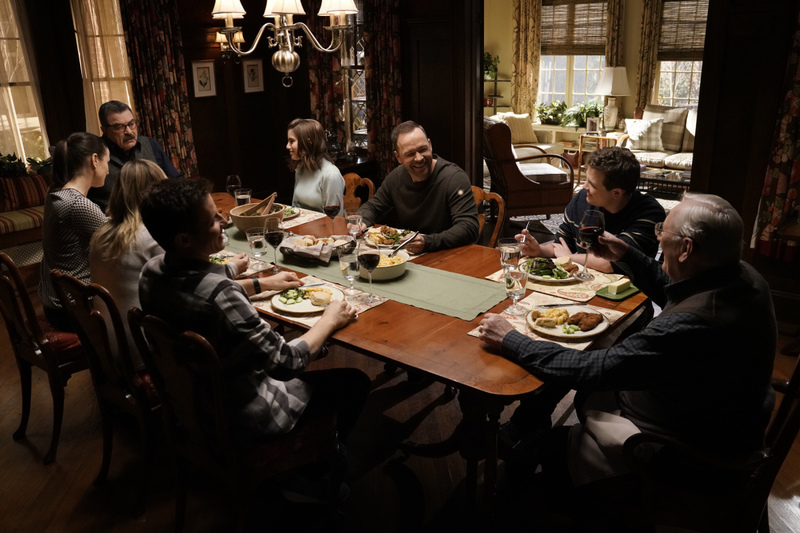 Also, Danny is hesitant to pursue a cold case after learning who the original detective was; Anthony begs Erin to stall a murder trial so he can gather more evidence; and Eddie is vexed by Jamie's disapproval of her joining a fraternal organization, on BLUE BLOODS, Friday, April 5 (10:00-11:00 PM, ET/PT) on the CBS Television Network. Pictured: Clockwise from lower right: Len Cariou, Will Estes, Vanessa Ray, Bridget Moynahan, Tom Selleck, Sami Gayle, Donnie Wahlberg, Andrew Terraciano. Photo: Patrick Harbron/CBS ÃÂ©2018CBS Broadcasting Inc. All Rights Reserved. Recurring guests appearing in “Rectify” include Andrew Terraciano (Sean Reagan), Abigail Hawk (Abigail Baker), Gregory Jbara (Garrett Moore), Robert Clohessy (Lt. Gormley), Steven Schirripa (Anthony Abetamarco), and Lauren Patten (Rachel Whitten). Additional guest stars include Aasif Mandvi (D.A. Samar Chatwal), Jaden Michael (Sam Jones), Joshua Harto (William Sloan), Stephen Rowe (Johnny Lyons), Patrick Daniel Faerber (Officer Robert Leary), Cynthia Elane (Foster Mom), and Malcolm A. Chavis (Perp).